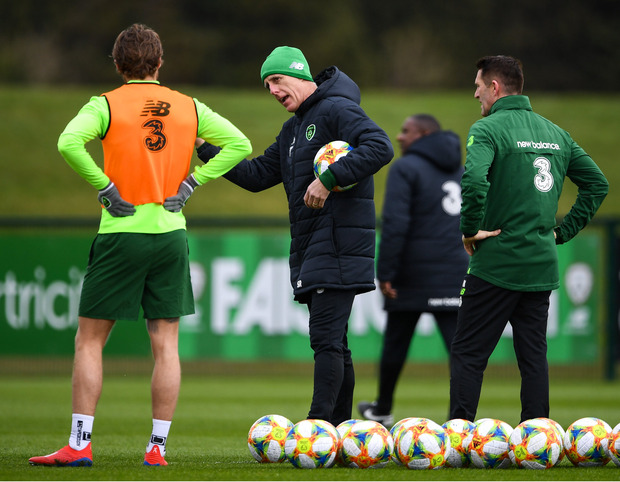 Republic of Ireland boss Mick McCarthy was a happy man after taking charge of his first training session since launching his second spell in charge. McCarthy put his players through their paces at Abbotstown on Monday morning. Asked how it had been, he replied with a smile: "You'd better ask the lads. I enjoyed it, it was all right. "It's just getting them going this morning. Generally they're on their second day of recovery on Monday morning now, players, they have just played lots of games, so it really was just getting them outside and me starting to do something as well. "But it was fine, it was good, I enjoyed it." Full-back Seamus Coleman did not train, but McCarthy revealed he had simply been rested after playing in Everton's 2-0 Premier League win over Chelsea on Sunday. He said: "He's fine. He was never going train the day after playing. Equally, the lads who played on Saturday, they're only doing minimal today. "We just want them right for this Saturday, I'm not really bothered what they did today. That's why some of them sat out." Derby defender Richard Keogh was not scheduled to train on Monday morning as he prepares to have a cast fitted to protect a hand injury, although he is expected to be able to play. McCarthy said: "Richard Keogh has got his hand in a cast - or will have - but I'm sure it will be passed by the authorities so he can play. It will be something he can play in."